On January 3rd 2017 our son George was diagnosed with cancer. A PNET soft tissue Ewing's Sarcoma. This is his story and our Giant Pledge to raise £1,000,000 to help beat childhood cancer so no other child has to suffer in this way. ”We decided to set up ‘George and the Giant Pledge’ because no child should ever have to have their childhood taken from them in this terrible way. On 3 January 2017 Vicki and James Woodall (Woody) received the news that’s every parent’s worst nightmare. They were told by doctors at The Royal Marsden Hospital that a lump they’d found on their then four-year-old son’s back was in fact cancer, a rare PNET soft tissue Ewing’s Sarcoma. From being a perfectly healthy and happy little boy George and the Woodall family’s lives changed overnight. Over the course of 2017 he endured 14 rounds of chemo, had part of his spine removed during 10 hours of complex surgery and received proton therapy in the USA thanks to the NHS. 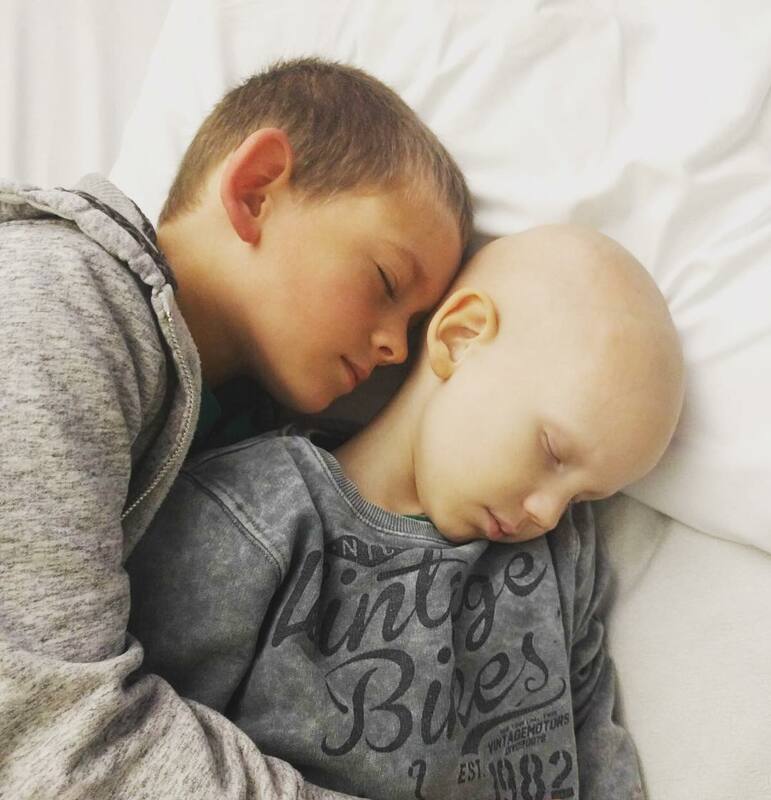 Vicki and Woody are trying to make the best of their bad situation and, despite navigating George’s difficult cancer journey, supporting his older brother and trying to maintain some semblance of family life, they’ve pledged to raise £1,000,000 to help beat childhood cancer. None of the money raised is directly for George, your donations will go 100% to the children’s team at The Royal Marsden Hospital to help fund much needed research into children’s cancer as well as help The Royal Marsden team continue the outstanding work they’re doing for children and families affected by cancer. Today I spent an unprecedented amount of time at the 2019 London Marathon Expo. The show where you pick up your running number and tracking tag as well as however many freebies you can carry 😜 On this very same day two years ago things took a very different turn for us as we were told for the first time George would have part of his spine and anything else that had been compromised by his tumour removed as part of his pending cancer surgery 😲 (Check out his tumour and the area in question as pointed at in tonight's picture by the white cursor). One year on and we were at the Marsden meeting their adult Ewing's Sarcoma expert learning more about this awful aggressive disease and discussing any potential options we could employ to help prevent George relapsing, albeit there weren't any 😢 Today things couldn't have been any more different, starting the day at Pilates with Chloe, George and Alex in school, then me making my way up to London to get myself marathon ready! ExCeL London was filled to the brim with inspiring people and so many brilliant causes and charities...and let's not mention the potential shopping opportunities available! Despite there being so many people I managed to bump into a very special family. A fellow FloridaProton crew we'd never actually met but that we've shared lots of messages with. Their son, just a year older than George, also had cancer and was sent by the NHS for treatment in America just after we left. Spotting them at the show, with the mum also taking on the London Marathon, made today even more special! Between us we've got this.